Curry’s double-double was the seventh of her career. Putting together one of her best all-around performances of the year, she finished with a solid 10-of-17 (.588) mark from the field, also adding 6 assists and a season-high 5 steals.Earning her fifth consecutive start, sophomore forward Marina Ewodo also filled up the statsheet, putting up 12 points (5-12 FG), 11 rebounds, 4 assists, 3 blocks and 3 steals. It was the second double-double of her career.The Highlanders finished with a season-high 15 steals, led by Curry (5), Jannon Otto (4) and Ewodo (3). They forced a season-high 22 turnovers, just two days after forcing Cal Poly to commit 21.Otto scored 14 points (6-9 FG) and Lauren Holt added 10 (2-5 3FG). Holt has now scored in double-figures in nine consecutive games.UC Riverside had a +23 rebounding margin on the day, setting a new season-high. 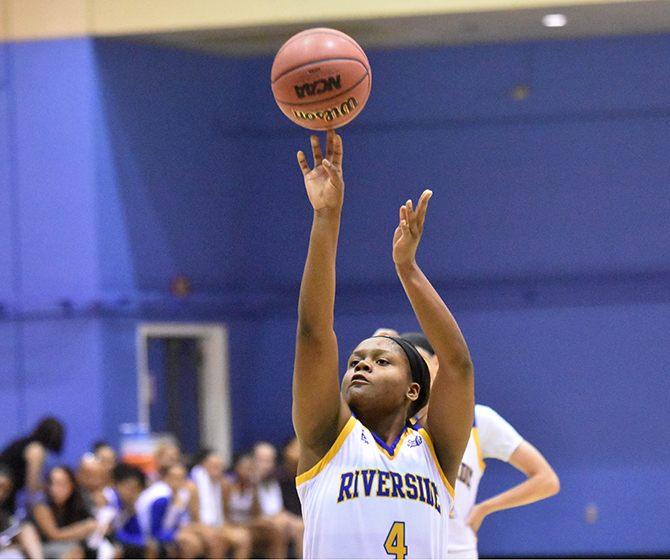 The Highlanders also enjoyed a dominant disparity in the assist department, tallying 19 helpers to Long Beach’s 4.Curry now has 1,088 career points, moving her up three spots on the UCR scoring list and into a tie with Ronéy Friend (1,088 points, 2005-09) at No. 13 all-time. She also surpassed Tawanna Terry (1,073 points, 1993-96) and Becky Geeson (1,081 points, 1987-91).The Highlanders will head on the road to face UC Davis this Thursday in their Big West road opener.